The word Malware stands for Malicious Software . It can consist of things like trojan horses, adware, worms, spyware and any other undesirable code which a hacker will try to inject into your website. Often when malware code has been inserted into your site you will normally not notice anything out of the ordinary based on appearances, but it can have a dramatic effect on your site’s search ranking. This is because the bots and spyders from search engines such as Google have the capability to detect malware when they are indexing the pages on your site, and consequently they can blacklist your website which will in turn affect your search rankings. 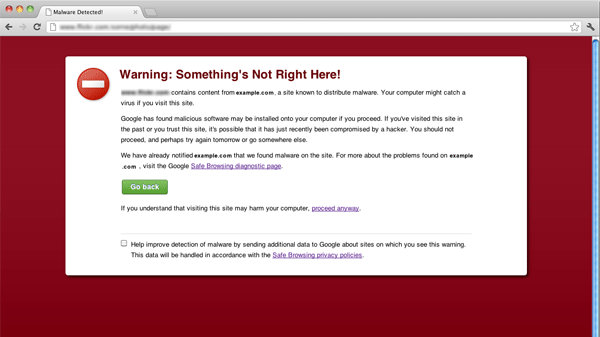 Finding out by accident that your site has been infected with malware is usually too late! Some website owners are unaware for weeks, months or even years that their site has been hacked and that it has malware. Of course when they do eventually find out, it is because they have noticed that their site’s traffic dropped and their revenue has been negatively affected. Don’t let malware infections and blacklistings by google and other search engines spoil all of the hard work you have put into your website and online business. Web sites need to be maintained with security monitoring to protect the web site integrity, availability and confidentiality. You never want to get to the point where visiting your site will show an warning like the one shown on the right. Our scanner will regularly scan your site and notify you as soon as it finds malware on your site. You will be able to take action and repair the hacking before your website or any visitor is harmed. Our scanner will also monitor your site’s response time regularly. This will help you identify if your site’s response time is being negatively affected so you can act on it. You will also know if your site is going down too many times without you knowing about it. Our scanner will also monitor the uptime of your site automatically. You will be notified whenever your site/server goes down so you can contact your hosting provider and quickly get it back up before you lose traffic. 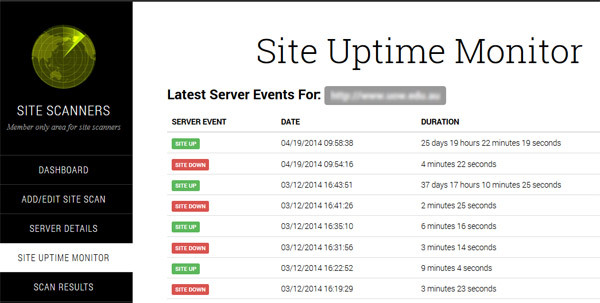 With our site monitoring, you will be the first to know when your website is down. A site which has been hacked with malware, spyware or other malicious code will very quickly be blacklisted by major search engines such as google and yahoo. If a hacker ever injects malicious code to your website, the scanner will find it out and let you know within 24 hours so you can take action before your site gets blacklisted. A blacklisted site will very often experience a dramatic drop in search rankings and traffic. 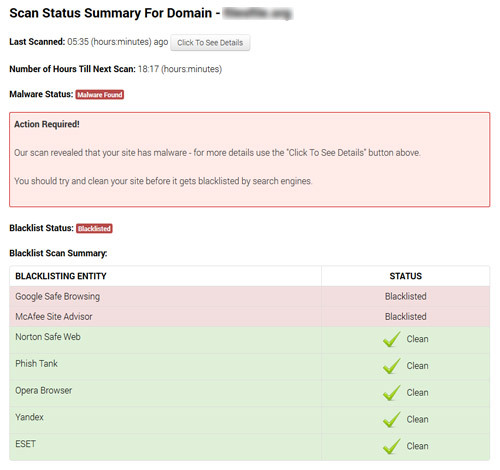 Our site-scanners service monitors your site’s blacklist status daily and if it finds that you have been blacklisted it will notify you immediately. 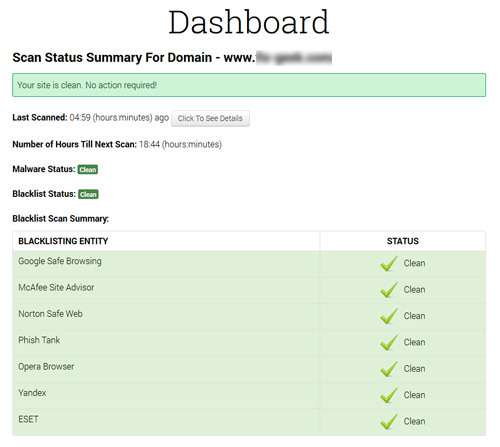 Feel safe in knowing that your site is being monitored daily for malware and that our notification service will keep you informed of your site’s malware and blacklist status by letting you know quickly if and when a malware infection has occurred on your site, so you can take action immediately before you are penalized with your search rankings. By being quickly and accurately informed if your site has been hacked can usually mean the prevention of the loss of thousands of dollars in potentially lost revenue! If your site is unfortunate enough to be injected with malware or other malicious code, we can help you quickly clean it and get it back to normal operation ASAP. How Does The Malware Scanner and Blacklist Detector Work? Our malware scanner is fully automated and easy to use. Once you have registered for an account, you will be able to enter the domain name of your website for scanning. Our scanner will then automatically scan every page of your site once daily and if it finds malware or other malicious code, it will immediately send you an email so that you can address the problem ASAP. The scanner will also check whether your site is blacklisted by the various search engines and blacklist entities, and if so it will send you an email to alert you. If there is any malware or unwanted code on your web pages, our scanner will find it and alert you before your site gets blacklisted. Avoid being hacked with daily scans, automated malware & vulnerability monitoring, blacklist monitoring, and more.